UK Triggers Article 50 – What Does This Mean For Your Business? On 29 March 2017, the British Prime Minister officially initiated the Brexit process by triggering Article 50. This was surrounded by much speculation and uncertainty about the impact it would have on the country’s economy and at a smaller scale, on the day-to-day of UK businesses. 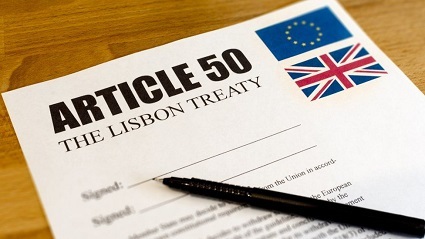 Although according to EU legislation, many things could still change during the upcoming negotiation process, the general consensus is that the implications of Article 50 will mainly affect trading relationships, access to human capital and to funding, and the free movement of services. The EU is the UK’s main trading partner, so determining the future terms of the trading relationship between both parties is paramount to many business groups in the UK. The negotiations could take up to 5 years to be finalised, and in the meantime, a temporary or transitional arrangement may be needed. UK Business associations claim that the impact could be minimised if issues like low or tariff-free trade deals and expedited customs are prioritised. Other alternatives include negotiating the UK’s accession to the World Trade Organisation, or expanding into new markets, such as the United States, Canada, Australia, or China. In fact, some UK businesses have stated that triggering Article 50 has only accelerated their expansion plan into other markets. The financial services is likely to be affected due to the possible loss of passporting rights. Job losses could also be substantial if some of the biggest banks decide to move operations outside of the UK. However, this industry has received assurances that any changes to the current situation would take place in a phased implementation, so they would not need to face drastic measures. Volatility in the stock market anticipated over the next two years, although triggering of Article 50 itself had very little effect in UK equities thus far. The pharmaceutical sector began preparing for a new scenario after Article 50 was triggered. This industry operates in a highly regulated environment, which currently allows any drugs approved by European Medicines Agency to be sold anywhere within the EU. Post-Article 50 negotiations will have to clarify where UK pharmaceutical businesses stand with regards to regulatory standards, clinical trials, access to other markets, intellectual property rights, and data protection. Retail, hospitality and leisure could be affected in terms of access to labour, as up to 20 per cent of staff are EU nationals. The end result will depend on whether a reciprocal agreement on residency rights is achieved. Access to talent from non-UK nationals also remains crucial for SMEs regardless of industry sector, since approximately 20 per cent of all members of the Federation for Small Businesses currently employ EU citizens. However, a different survey found that 42 per cent of owners of small businesses claimed Article 50 would have no effect on their operations. Higher education, R&D, and technology could also be affected, as many key institutions are currently receiving EU funding. For the aviation sector, the main challenges involve the possible need to relocate their headquarters or disinvest UK shareholders should they wish to continue operating flights between EU countries. The food and drinks sector could be affected if the British executive fails to negotiate a tariff-free agreement, as higher tariffs could lead importers to raising their prices in order to stay competitive. The same applies to the agribusiness industry, although business owners in this sector have been assured that the UK will maintain the current levels of financial support until 2020. In the wake of the events that led to triggering Article 50, UK businesses would be wise to reassess their operational chain in terms of costs, staffing, and supply, as well as their banking and funding needs. In short, it is now time to be proactive and to prepare for a new regulatory and trading environment that will lead to new challenges but also to new opportunities.